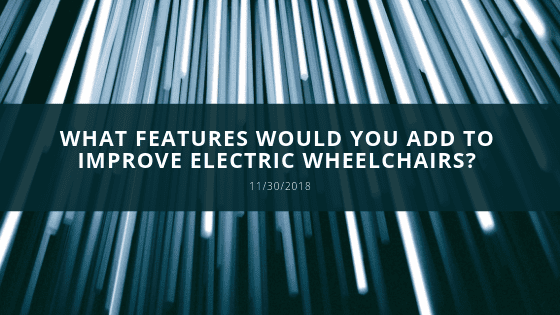 The best features to add to an electric wheelchair would be those that increase wheelchair mobility and allow the wheelchair to serve a wider range of purposes. Wheelchair users are faced with daily tasks that have become a headache due to the lack of mobility or their wheelchairs do not serve that specific purpose. A big issue for wheelchair users is not having wide enough hallways at times to get through and even the littlest of tasks that may include getting to a location using a narrow hallway becomes nearly impossible. A feature that allows wheelchairs to adjust the width would be extremely beneficial because that nightmare of struggling to get somewhere would be solved. Having to go get around in an electric wheelchair that does not absorb any shocks and thus makes any ride uncomfortable especially in the uneven surfaces. A feature that would be of great help to have a smoother ride would be a suspension system that allows each wheel to elevate as much as possible when passing bumps. When in a wheelchair it is very difficult to reach items placed on top shelves and even on the counters due to wheelchairs being sort of low. A feature that would help solve this issue would be installing a powered hydraulics suspension that allows the electric wheelchair to elevate to the desired height. This would make reaching for things much easier and wheelchair users would be able to complete a task without fearing of something falling on them due to having to reach out to pull on them. Wheelchair users do not have a choice and have to sit for many hours throughout the day and that can be uncomfortable for many especially when the cushions are not as comfortable themselves. The materials used on wheelchairs help vent out body heat yet can still be very uncomfortable on hot days. A feature that would help solve this issue would be a recliner option so when users get tired of sitting they can recline and levitate pressure off their backs and bottom end. This feature will also help disperse body heat throughout a larger portion of the body instead of just the rear end. It wouldn’t only be a muscular benefit but a health benefit as well. This feature can help prevent moisture becoming trapped due to sitting long periods of times that can cause infections or rashes. The ability to go from sitting to laying down can also help prevent anxiety and increase the pace new wheelchair user become used to an electric wheelchair.